Colour blindness (colour vision deficiency, or CVD) affects approximately 1 in 12 men (8%) and 1 in 200 women in the world. In Britain this means that there are approximately 2.7 million colour blind people (about 4.5% of the entire population), most of whom are male. The term Colour Blindness is misleading because people with this condition are not blind, they just see things in a different way to people with normal vision. Although this condition is usually passed genetically from the mother, it can occur at any age due to illnesses such as diabetes and multiple sclerosis etc. Because the person does not know they are seeing things differently, it is important to check for colour blindness especially in children. We use standard colour blindness testing which comprises numbers or letters mixed in dots on a page similar to the illustration above. 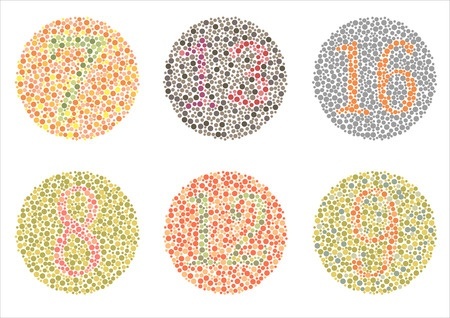 Our trained staff can identify from your answers if you have any colour blindness, and if so, what type.